As a dietitian (20 years now #gah), I’ve seen so many diet and food trends come and go. Some I’m thrilled to see fall off the radar (bye bye Snackwell cookies) and some more happily, I love to see stick and become part of people’s everyday lifestyle. I consider hummus one of those foods. Unless you were exposed to Middle Eastern cuisine through family, friends or authentic restaurants, it just wasn’t something that was a staple in the American diet. But now in 2016, one look in the refrigerated case at your local store makes it clear that hummus has gone from trend to staple – much to the delight of this dietitian. Hummus has gone from a basic dip to a flavorful ingredient in everything from pizza to deviled eggs. And now Sabra is getting on the sandwich condiment bandwagon with its new line of Sabra Spreads. 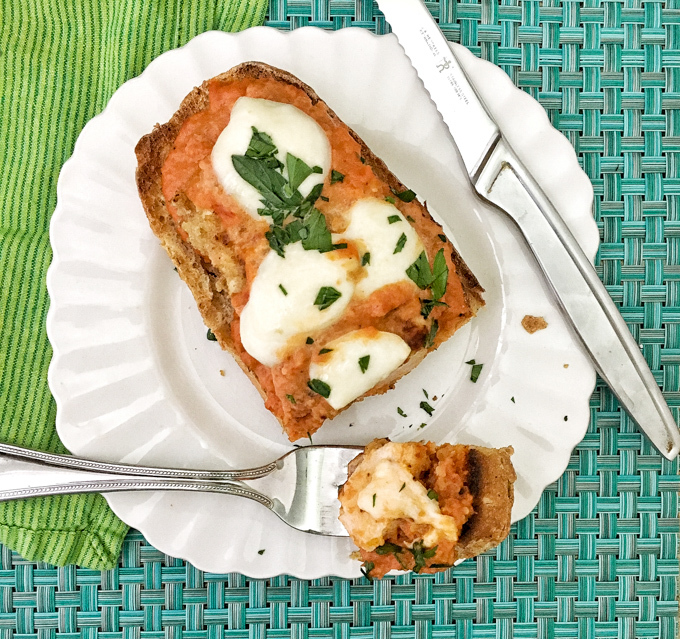 This month, Sabra is challenging our Recipe ReDux members to “Take Your Sandwich from Good to Great” in a sponsored recipe contest. Since I regularly mash beans into my tomato sloppy joe sauce, I figured it wouldn’t be too much of a stretch to mix hummus (aka chickpeas) into a sauce for Chicken Parm. I mixed 2 parts canned pizza sauce with 1 part the Sea Salt and Cracked Pepper Sabra Spread and it added a fantastic zip along with a little extra fiber and protein. I might have to start mixing hummus into all my tomato sauces from now on – want to try it with their Garlic and Herb flavor next. 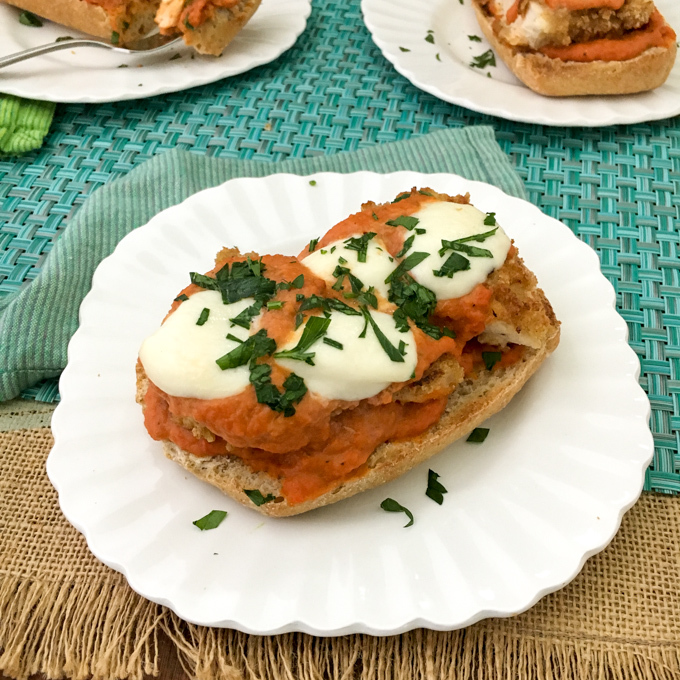 Upgrade your Chicken Parmesan Sandwich in flavor and nutrition with this special ingredient! Place whole wheat flour in a small bowl. In another small bowl, whisk together egg and buttermilk. In a third small bowl, mix together panko crumbs and Parmesan cheese. Pound chicken breast so they are flattened and even. Divide/cut into six portions. Dredge each portion into flour first, then egg mixture and lastly dredge in Parmesan mixture until completely covered. Place on cooling rack until all chicken pieces are coated. Place skillet over medium heat and add oil. Add chicken and cook for 4 -5 minutes per side or until completely cooked through. Remove from skillet. Remove from broiler and sprinkle with fresh parsley, if desired. Serve immediately with fork and knive. What’s your favorite condiment on a sandwich? Do you ever spread hummus on bread? This looks great! I agree, so many trends but thank goodness good ole fashioned hummus is here to stay! I love the concept of making this open faced, and nice work on the Snapseed editing–it really makes this pop! I am ready for lunch NOW!! Oooo the garlic & herb one would be sooooo good in here!!! YUM! 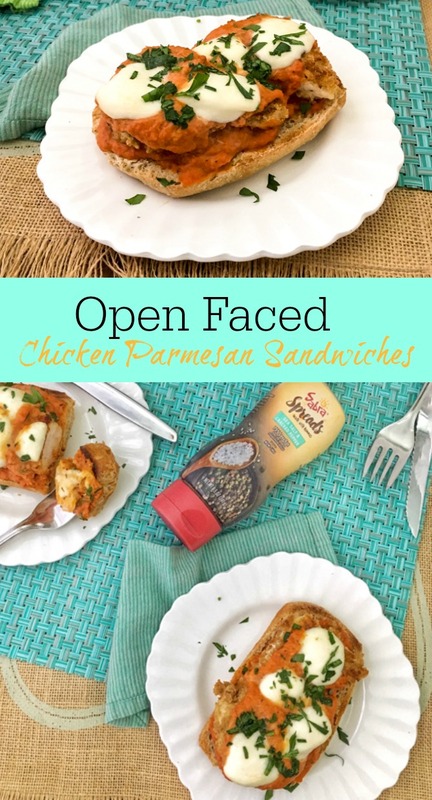 It was a total toss up on whether or not to use the garlic & herb vs. the cracked pepper & sea salt! I feel like the hummus section of my grocery store gets bigger every day- so many amazing varieties! I really love how you used the spread here- so creative and so delicious! I know – it’s like where the yogurt section was 5 years ago! I’m definitely craving this for a late lunch now! These look delicious! !